The circular economy is now seen as potential driver for sustainable development by business, academia, and policymakers. In such a future circular economy, new business models need to be developed that slow, close and narrow resource loops to address key resource and climate challenges. However, this is not easy and new tools and methods are necessary to support the transition and development of such new business models. In the new collaborative paper with Lars Strupeit, Katie Whalen, and Julia Nußholz, we map the field of Circular Business Model Innovation (CBMI) tools. We find that there are many generic tools and approaches that might be used, such as the lean startup approach by Eric Ries, or the business model canvas by Osterwalder & Pigneur. Also there are various sustainability focused tools such as the value mapping tool. 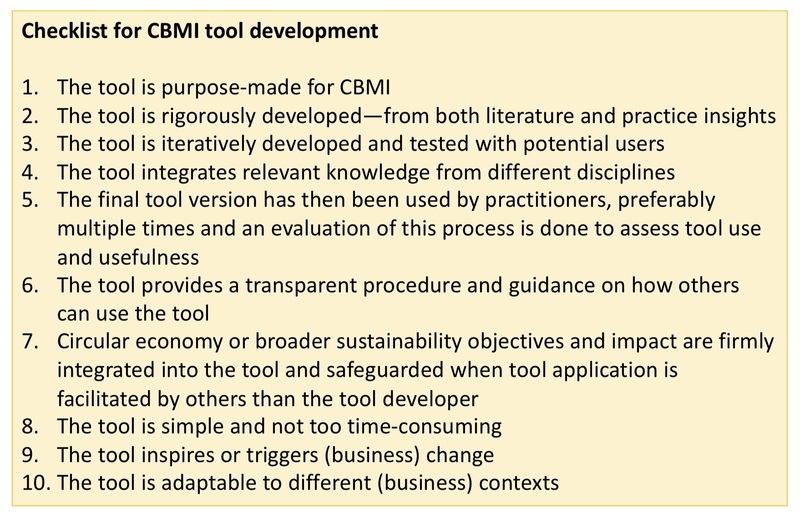 However, few specifically focus on CBMI, and the generic tools and approaches might ‘dilute’ the circularity or sustainability message. We classify the tools according those that focus more on Ideation and Design, Implementation and Testing, and Evaluating and Improving circular business models, building on the work on business model innovation by Frankenberger and colleagues, amongst others. Finally we develop a checklist that could support future ‘tool developers’ (Figure 1, below). This checklist might also be of interest to those developing sustainability tools, by replacing the first line with ‘The tool is purpose-made for sustainable innovation’. Future work will involve collaborative development of CBMI tools and roll-out to help make circular business models more widespread. Figure 1. Checklist for CBMI tool development. Source: Bocken, Strupeit, Whalen, Nußholz (2019). This entry was posted in Circular Business, Sustainable business experimentation, Sustainable Business Models by nancybocken. Bookmark the permalink.